Public health officials have sounded alarm bells after military researchers cared for the first patient in the United States to be diagnosed with germs that resist an antibiotic that is considered a therapy of last resort. The 49-year-old woman in Pennsylvania, who has not been identified, has recovered from a urinary tract infection, which was cultured and produced such unusual results that physicians sent samples for further testing to the Walter Reed Army Institute of Research. There, investigators found a superbug─e coli bacteria that are resistant to colistin. That’s an old antibiotic that the Chinese use widely in pig and poultry farming. American doctors reserve colistin, which can harm patients’ kidneys, to treat infections impervious to other, more commonly relied on antibiotics, such as class of them called carbapenems. 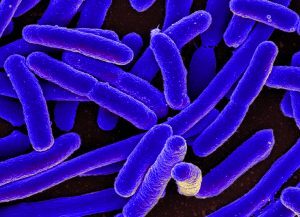 Here’s why experts express such grave concern about the detection in the United States of colistin-resistant bacteria, which previously had been found only overseas, such as in China: Bacteria not only develop antibiotic resistances on their own. They also have shown they can share genes and spread resistances, especially in particularly problematic environments like hospitals full of sick patients. CRE strains themselves now are rare, causing about 600 deaths annually. But they have been surging, with officials detecting them in 44 states. A CRE strain, combined with colistin resistance, could imperil hundreds of thousands of patients, for whom there would be little treatment recourse, experts said. The Washington Post reported that this disastrous, worst-case scenario could result in routine operations becoming deadly, minor infections life threatening, and pneumonia a nightmarish condition. In Pennsylvania, health officials plan to test and interview the patient with the colistin-resistant infection. They also will talk with friends and family to learn more about her case, which, it turned out, could be treated with carbapenems. I’ve written before about the giant health hazard that antibiotic overuse poses, how superbugs are flourishing, and how thousands die due to infections they acquire in hospitals, nursing homes, and other medical care facilities, including some held in high repute. The Obama Administration and Congress, in bipartisanship that’s almost as rare as dry spring days have been recently in Washington, has boosted funding for several government agencies to step up their campaign to curb antibiotic overuse, to increase research for new antibiotics, and to find therapeutic alternatives.